NSA (National Security Agency / Central Security Service NSA/CSS) er en af USA's sikkerhedstjenester (efterretningstjenester). NSA har især til opgave at aflytte, indsamle og analysere alle former for kommunikation. NSA er underlagt forsvarsministeriet. Etatens budget er hemmeligstemplet, men det antages at være betragtelig større end CIA's. NSA er verdens største arbejdsgiver for matematikere. Hovedkvarteret ligger på militærbasen Fort George G. Meade i Maryland udenfor Washington D.C.
NSA samarbejder med øvrige NATO-landes efterretningstjenester. Som led i NSA's verdensomspændende net af elektronisk spionageanlæg er der bygget lytte- og pejlestationer også i Norge og Danmark – bl.a. på Bornholm. NSA er specielt kendt for efterretningsnetværket Echelon. ^ Thomas L. Burns (PDF). The Origins of the National Security Agency. s. 97. Arkiveret fra originalen 2016-03-22. ^ (PDF)60 Years of Defending Our Nation. National Security Agency. 2012. s. 3. Hentet July 6, 2013. "On November 4, 2012, the National Security Agency (NSA) celebrates its 60th anniversary of providing critical information to U.S. decision makers and Armed Forces personnel in defense of our Nation. 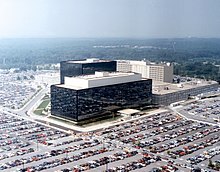 NSA has evolved from a staff of approximately 7,600 military and civilian employees housed in 1952 in a vacated school in Arlington, VA, into a workforce of more than 30,000 demographically diverse men and women located at NSA headquarters in Ft. Meade, MD, in four national Cryptologic Centers, and at sites throughout the world." ^ Priest, Dana (July 21, 2013). "NSA growth fueled by need to target terrorists". The Washington Post. Hentet July 22, 2013. "Since the attacks of Sept. 11, 2001, its civilian and military workforce has grown by one-third, to about 33,000, according to the NSA. Its budget has roughly doubled." ^ "Introverted? Then NSA wants you." Florida Championship Wrestling. April 2012. Hentet 1. april 2013. ^ Prism Exposed: Data Surveillance with Global Implications. Spiegel Online International. 10. juni 2013. s. 2. "How can an intelligence agency, even one as large and well-staffed as the NSA with its 40,000 employees, work meaningfully with such a flood of information?" ^ Gellman, Barton; Greg Miller (29. august 2013). "U.S. spy network's successes, failures and objectives detailed in 'black budget' summary". The Washington Post: s. 3. Hentet 29. august 2013. ^ Shane, Scott (29. august 2013). "New Leaked Document Outlines U.S. Spending on Intelligence Agencies". The New York Times. Hentet 29. august 2013. Denne side blev senest ændret den 23. juni 2018 kl. 11:53.